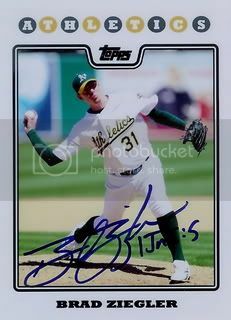 Oakland A's reliever, Brad Ziegler, signed the custom card we made of him. This is our fourth signed custom card. Pretty cool. 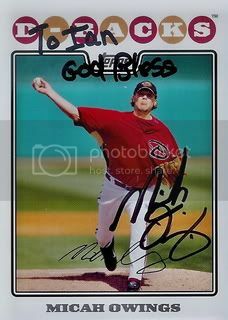 Former Arizona Diamondbacks pitcher and fan favorite, Micah Owings signed a card for our set. This one took over a year to get back to us but was well worth the wait. Our friend raiderdan on SweetSpotGraphs.com sent us two more signed cards for our set. Thanks, Dan! 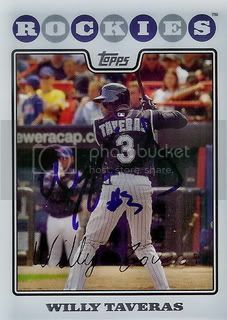 The second card is of former Rockies speedster, Willy Taveras. 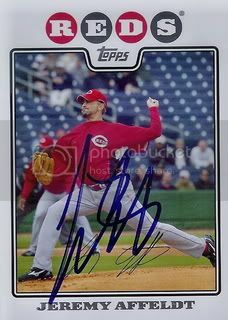 The first is of current San Francisco Giants pitcher, Jeremy Affeldt. Sent this one off as a TTM request during Spring Training. Pretty cool to get it back mid-season. Thanks, Aaron! The 2010 Hall of Fame inductions are today. One of my favorite players, Andre Dawson, is being inducted. One of my other favorite Hall of Famers recently signed the custom card we made. 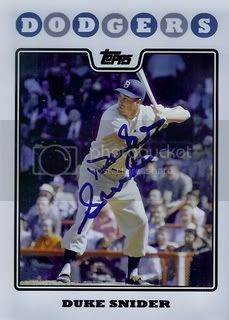 Dodgers legend, Duke Snider. Thanks, Duke! This card looks great! 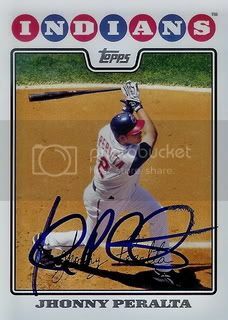 After not getting Jeff Suppan's autograph in person during Spring Training, we sent off his 08 Topps cards as a TTM request. Thought this one might have gotten lost when he was dropped by the Brewers. Fortunately for us, Jeff must have brought our letter with him to St. Louis. Thanks, Jeff! Blog reader Dan has been going to a few Cleveland Indians games lately. He was nice enough to send over four signed cards for our set. Thanks, Dan! 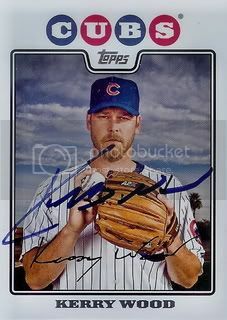 The final card Dan sent over is of one of my favorite players, Kerry Wood. He isn't the same pitcher he was pre-2003 but I'm still a fan for what he did for those few years while wearing Cubbie blue. 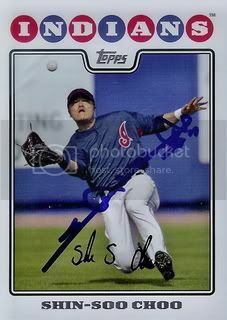 Next up is Shin-Soo Choo. Choo put up big numbers last season and turned into a fantasy baseball must. He was doing well this year too until hurting his shoulder last month. 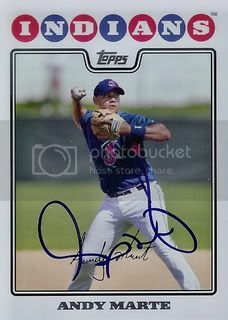 The second card he sent is of former super-prospect, Andy Marte. The first card he sent was of Jhonny Peralta. Did you see his inside the park home run yesterday? Classic. One of my favorite things to do each year is to check and see how many of the All-Stars I have autographs of. 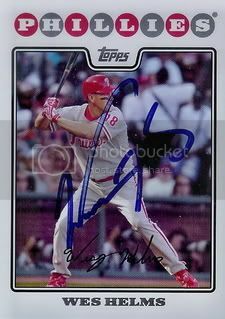 Last year I did a post ( 2009 All-Star Game ) where I added up the number of 2009 All-Stars who we had a signed 08 Topps card of. At that time we had 121 total 08 Topps cards signed and only 6 of them were on the All-Star roster. With this year's All-Star game only a few hours away I wanted to check out the rosters to see how many of the players we have signed 08 Topps cards from. Below are the twenty-five 2010 All-Stars that we have a signed 2008 Topps card of. 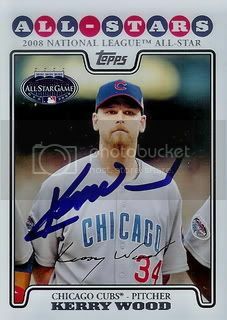 Two-time All-Star Kerry Wood signed his card from the 08 Topps Updates & Highlights set for us. Like most Cubs fans, I was Kerry Wood crazy back in the late 90s. Really glad to add this card to our set. Are you excited about the All-Star game next Tuesday? I am. 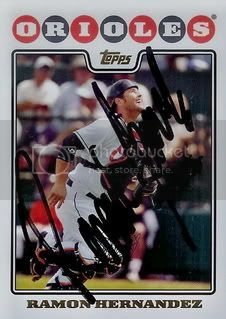 2007 National League All-Star Chris Young signed a card for our set. 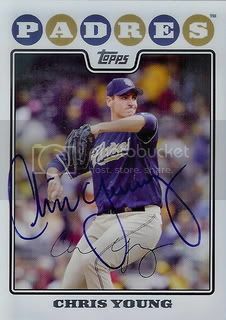 Chris has spent the past few years with San Diego and is one of the nicest players anyone could meet. 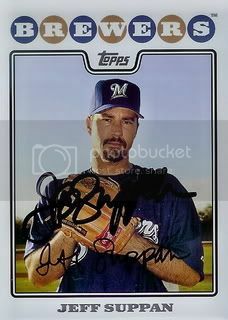 I remember seeing Wes Helms in Spring Training back around 2003 or 2004 when he was with the Milwaukee Brewers. He was a tough autograph back then. 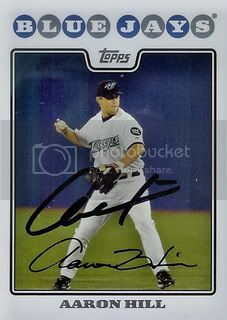 We're glad to add his signed 08 Topps card to our set. Next up is Jose Valverde. I bought this one of eBay from that guy who gets a bunch of autographs each winter in the Dominican Republic. 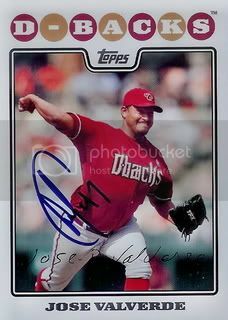 Nice card of a former D-Back and 2007 All-Star. You can't get any more American than by sitting down and watching the Nathan's Famous Hot Dog Eating contest on the Fourth of July. 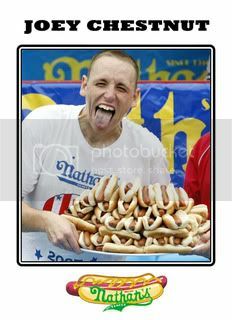 In just a matter of minutes, Joey Chestnut will look to win his fourth consecutive contest. It won't be the same this year without Kobayshi but we'll still be watching. Finally. 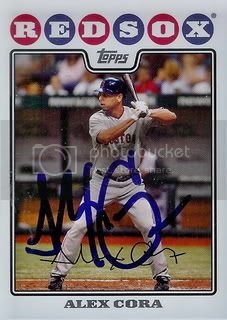 Signed 08 Topps card # 300. It seems like we've been really close to this milestone for awhile but now it's official. 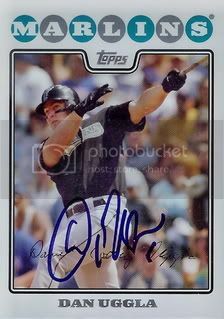 Two-time All-Star Dan Uggla gets the designation of being out 300th signed card. My son's second birthday is getting dangerously close. I remember when I decided to start this project I thought if I could get a few hundred signed cards for him it would be great. That goal has been reached but I'm not ready to stop yet. In case you were wondering... yes, he does like his cards. He likes to look at the pictures and say "ball" or he likes to take them out of the box and throw them around the room. Fortunately they are all in top loaders so I don't really mind. Ramon Hernandez signed a card for our set. You may remember him from the 2003 All-Star game where he was selected to represent the Oakland A's. Unfortunately the 2010 All-Star game selection show is on Sunday at the exact same time as the Nathan's Hot Dog Eating Contest. Maybe I'll Tivo it. Starting off July with another signed 08 Topps card. This one is of infielder, Alex Cora. Alex was part of the 2007 World Series Champion Boston Red Sox.